As Kiss prepare to head out on the road one last time, the band have confirmed they’ll play a special show in Los Angeles next month. For the first time in 20 years, they’ll play a club show in the US when they take to the stage at the Whisky A Go Go on the Sunset Strip on February 11. The show will be an invitation-only only event for SiriusXM subscribers and the performance will be aired on Kiss Army Radio via the broadcasting company the following day. The concert will also be on Howard Stern’s 101 channel on February 15. The concert will also be the first time Kiss have played at the world famous venue. 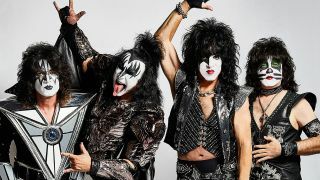 Kiss Army Radio will be a limited-run on SiriusXM and will play music from throughout the band’s career and feature interviews with Paul Stanley, Gene Simmons, Tommy Thayer and Eric Singer. The station will also play music by artists who have opened for Kiss in the past, including AC/DC, Guns N’ Roses and Alice In Chains. Kiss Army Radio will launch on February 4 via satellite on channel 30 and will run until February 17. Kiss will start the End Of The Road tour in Vancouver later this month.